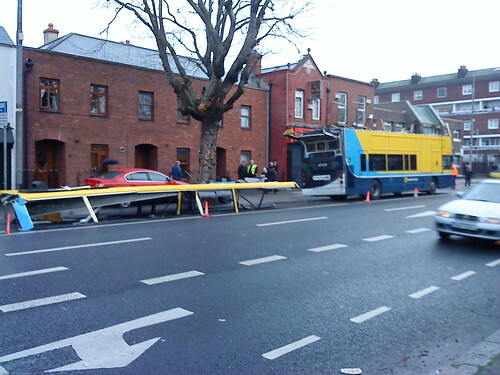 A bus hit a tree this morning just past the Five Lamps. Looks like it clipped a tree (notice the damage on the tree just where the branches start to fan out) and it stripped the roof off. Don’t know if there were any injuries. Clipped it how hard exactly? What is a bus doing going that fast on that stretch of road? It wouldn’t need to be going that fast. The vertical slats that support the roof have no shear strengh and would snap easily. Remember the bus has huge inertia when it is moving. Notice that it only hit the left hand side of the bus, but the whole roof came off. He must have been going reasonably fast. I’ve been in a bus that hit a tree like that. The front upstairs window was smashed, the pillars were bent a bit. The roof was most certainly *not* taken off (I was sitting upstairs in the middle, so I would have noticed!). Nobody else wanna stick the word “Fail” on this…? They’re damn lucky no one was sitting upstairs. Imagine that with a packed bus! From other photos it looks like s/he was driving in the cycle lane a good bit before needing to pull in to the bus stop (which is just in front of the bus). Have you seen the latest pics? I don’t understand this – having looked at all the pics I am asking – a)do no other double deck buses ever go along here? b) if so how is it they haven’t lost their roofs? c) it looks like the tree sliced across the whole top, how far did the branch stick out? d) I don’t see the branch on any of the pics, how big was it? So, the bottom of the branch caused all that damage? Interesting, it would appear that a ‘good belt’ on the top corner of the roof (that’s about where it hit the bus) causes it to lift off???? Great!! OTOH, maybe it is designed to do that, seriously, if it comes off clean like it appears to would it have hit anybody upstairs? ?